Recent innovations in affordable information and communication technologies (ICT) have led to increased interest in using crowdsourcing to collect data, opportunities for more efficient data collection and information dissemination, and reforms in information management within public agencies. Many of these tools offer control and validation features, allow for georeferencing, and allow for mapping of social and biophysical data in the field at a lower cost. Electronic data that can be easily manipulated and replicated is particularly interesting in forest landscape projects, where interventions cut across sectoral boundaries—such as forests, energy, agriculture, and environment—since electronic data management allows for efficient cross-agency use of data. However, questions and challenges remain. Many systems and applications are developed as pilots without adequate consideration for scaling up. Selecting the right application among a proliferation of tools can be daunting. Specialists in rural development are not necessarily aware of application options. The project has a general goal of showcasing the potential and application of ICT in data collection and M&E for Bank staff, external partners and governments. The project aims to assist development practitioners in selecting appropriate technologies and applications for data collection and M&E, improve the quality of knowledge on ICT applications, and inspire the use of these tools in development projects via information distribution. This will lead to better interventions and improvements in program and policy design, implementation, and output and outcome tracking. • Output 1—A peer-reviewed analytical report that reviews the most prominent data collection and monitoring and evaluation applications (focusing on cellular phones), and service providers available for forest and agricultural interventions. 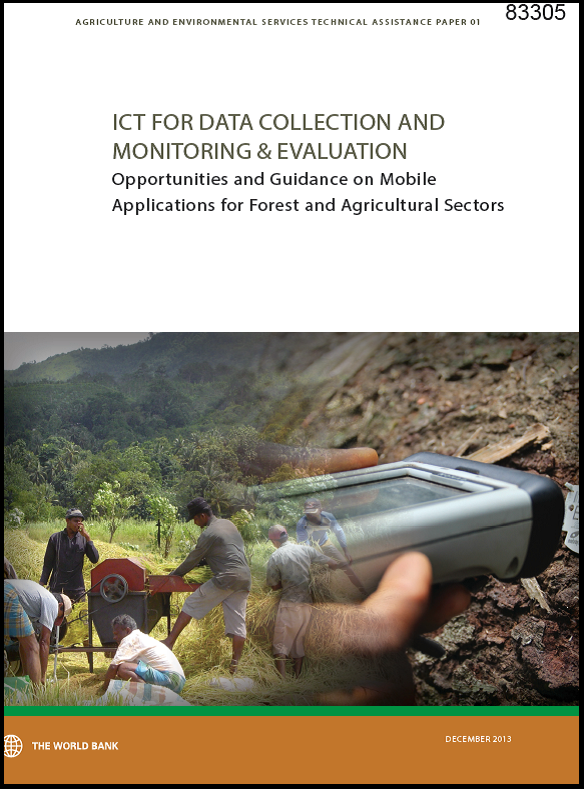 The report, “ICT for Data Collection and Monitoring & Evaluation—Opportunities and Guidance on Mobile Applications for Forest and Agricultural Sectors,” helps practitioners select the most cost-efficient tool that best fits their specific data needs. • Output 2—A database of application providers with key features and filters to search and compare products. The information captured includes key features of an application when developing a system (for example, offline capacity, GPS capable, and platform), thus it addresses both the advantages and the downsides for a particular context. The database is hosted by NetHope Solutions Center, a nongovernmental organization specialized in providing IT tools for development practitioners. • Output 3—A full-day marketplace event on ICT for data collection and monitoring and evaluation. The event, held in Washington, D.C. on March 2013, and attended by close to a 100 development practitioners and service providers, featured the launch of the report.